Mulch has many benefits to a garden. It helps to retain moisture and suppress weeds, it can also improve soil conditions (depending on the type of mulch used) whilst protecting roots from extremes of weather. Best applied in the Spring and Autumn, when soil is moist and warm, when applied correctly, mulches are unlikely to have any detrimental effect on your garden. According to the RHS Website, "single trees and specimen shrubs are best mulched to the radius of the canopy". This is where the EverEdge steel Garden Ring is so useful for gardeners. 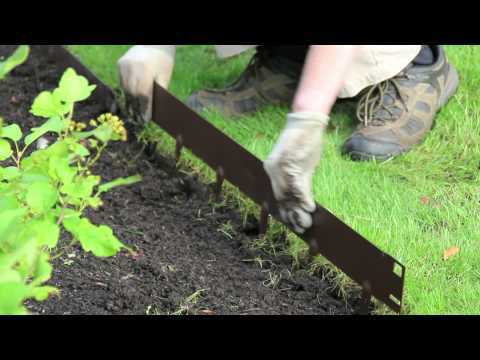 The ring quickly and easily allows gardeners to create a pit around trees and shrubs. This pit can be filled with beneficial mulches. Created from pre-curved steel strips, the EverEdge Garden Ring could not be easier to use. For more information, visit the Garden Ring page. A simple installation video can also be seen here.